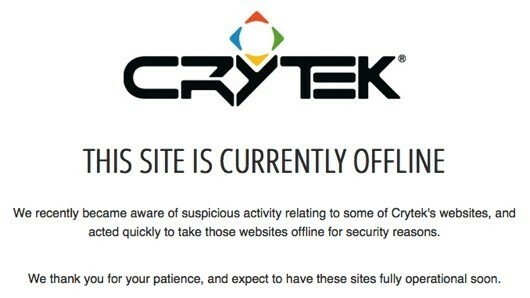 Crytek recently took down a number of their websites following the discovery of suspicious activity. The company said in a press release on the matter that the incident may have resulted in some users’ login data being compromised. We’re told that the security breach affected Crytek.com, Mycryengine.com, Crydev.net and Mycrysis.com. These sites have all been taken offline for now. Crytek said it was uncertain whether the incident led to the copying and decryption of e-mail addresses and passwords, but it is possible that users with accounts at these sites have had personal data copied. The company has since contacted all affected users via e-mail to inform them of the potential security breach. As such, the next time account holders visit the sites listed above, they will be prompted to change their passwords during login. Additionally, they recommend that users change their password for other locations that used the same login credentials as the affected Crytek sites. Crytek promised to announce when the sites will be back online as soon as possible. Until then, they will be doing everything in their power to ensure a similar incident doesn’t happen again in the future. It’s worth pointing out that Gface.com, Crysis.com and Warface.com were not affected by the incident. As such, those sites remained online during the whole process. Do you have an account at any of these sites or have you been affected by the recent string of site hackings?